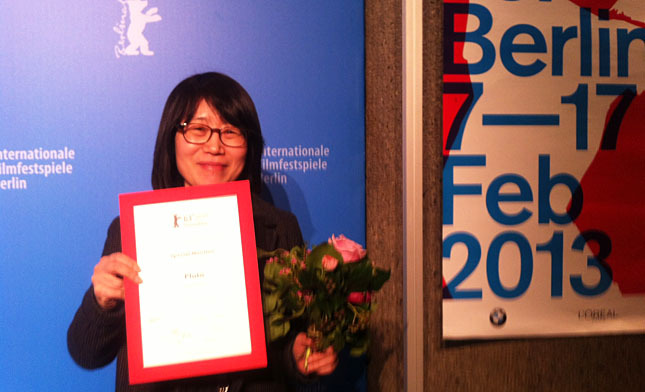 A Korean film has won yet another award on the festival circuit in early 2013 as SHIN Su-won’s Pluto, which premiered at the 17th Busan International Film Festival, has picked up a special mention from the 63rd Berlin International Film Festival’s Generation Section. Meanwhile, Kasia Rosaniec’s Baby Blues from Poland won the section’ top prize, the Crystal Bear. SHIN’s film, which deals with the consequences of intense pressure within Korea’s highly competitive educational system, was one of the most talked-about films during last October’s Busan Film Festival and has carried over that momentum to the Berlinale, where it competed in the Generation 14plus section. This win follows Jiseul’s triumphs at the Sundance Film Festival last month, where it won the Grand Jury Prize in the World Dramatic Competition, and at the Vesoul International Film Festival of Asian Cinema earlier this week, where it picked up the top prize, the Cyclo d’Or. Hopes are high for other Korean films to pick up more awards at the ongoing Berlinale as HONG Sangsoo’s latest Nobody’s Daughter Haewon competes for the Golden Bear and LEESONG Hee-il’s White Night vies for the Teddy Bear.